They've been serving up BLTs, hot salami and sweet treats for generations. But for all the accolades the city is getting for its next generation of restaurants, St. Louisans love this city’s history and long-standing favorites. 5 On Your Side dug into the history books and found several restaurants that have been serving up delicious dishes for generations of St. Louisans. Here are 15 restaurants that have stood the test of time. Know of a restaurant we missed that should be on this list? Email us here! A St. Louis tradition—and possibly the oldest running restaurant in St. Louis. Harry Karandzieff and Pete Jugaloff opened the doors in 1913, using candy-making skills they picked up in Greece. They wanted to create a family-friendly place to share their delicious creations. More than 100 years later, Harry’s family continues the sweet tradition. The third generation runs the business, with a little help from the fourth generation. Stepping into Crown Candy is like walking into a time machine. The restaurant boasts St. Louis’ oldest soda fountain. As the name suggests, Crown Candy is perfect for anyone with a sweet tooth. There’s homemade chocolate, sundaes and malts galore. But there’s also a challenge, if you choose to accept it. Since they opened in 1913, anyone who can drink five malts in 30 minutes gets them free. Even Adam Richman on 'Man vs. Food' couldn’t finish this challenge. But don't forget about Crown Candy's famous BLT—emphasis on the "B"! Sitting on the edge of Dogtown, this throwback St. Louis restaurant dates back to 1916. Alex Failoni and his wife Rose bought the location from the Lemp family. Since then, it’s been a family tradition. Failoni’s website states you might hear Alex Failoni Jr. sing Frank Sinatra tunes, while the next generation cooks up healthy servings of Sicilian steak and another family member makes the drinks. Failoni’s says Friday nights at the restaurant will take you back to the days of dinner-nightclubs in the 1940s, 50s and 60s—think, Chicago’s Villa Venice Café or New York’s Copacabana. “Gioia’s Deli and hot salami are one and the same,” said Alex Donley, who co-owns the restaurant with his mom, Cathy. In 1918, Charlie Gioia opened the deli in St. Louis’ famous Italian neighborhood The Hill, and it’s been slinging hot salami ever since. In 1980, the Conley family bought the restaurant, turning it from a market into a deli. But how they make the famous meat hasn’t changed for generations. “We make the hot salami in the same room, using the same process that Charlie and his sons did 99 years ago,” Alex Donley explained in a 2017 interview for the James Beard Foundation, which awarded Gioia’s the America’s Classics award. While Gioia’s started on The Hill, it has since expanded into downtown St. Louis and west St. Louis County. Amighetti’s boasts one of, if not the best sandwiches in St. Louis. The Amighetti Special starts with fresh bread made daily since 1921. The sandwich is stuffed with ham, beef, salami, brick cheese, lettuce, tomato, onion, pepper and Amighetti’s own special dressing. Al’s is St. Louis’ oldest single-family restaurant that’s locally owned and operated. They’ve been in the same spot along the Mississippi River since 1925. The restaurant was started by Albert Barroni Sr. as a tavern selling sandwiches to dock, factory and railroad workers on the riverfront. The next generation of family transformed it into a sophisticated eatery, welcoming sports celebrities, movie stars and political dignitaries. The third and fourth generations of the Barroni family are now in charge, continuing the family tradition. The restaurant has changed locations over the years, but authentic Italian cuisine has always been on the menu. Joe Kemoll and his wife Gaetana first opened Kemoll’s in 1927 on N. Grand Boulevard near the old Sportsman’s Park. Mrs. Kemoll learned how to cook from her mother, using authentic Sicilian recipes that are still served today. Now, a fifth generation of the family is keeping the tradition going. Kemoll’s is credited with introducing several dishes to St. Louisans, including cheese bread, fried artichokes, cannelloni, manicotti and calzones. In 1990, Kemoll’s moved into the Metropolitan Square building, serving up Italian cuisine and great views of the riverfront. 2019 is bringing a new beginning for the 92-year-old restaurant. Kemoll’s is closing its downtown location on Jan. 31 and moving to Westport Plaza in St. Louis County. The restaurant will re-brand as Kemoll’s Chop House, but you’ll still be able to find many of the favorites on the menu. Lombardo’s specializes in signature pastas, hand-cut steaks and fresh seafood. It’s also one of several St. Louis restaurants embroiled in a debate that will likely never find a resolution—who really invented St. Louis’ famous toasted raviolis? The owners of Lombardo’s say they did it first—and they have the proof. The restaurant has an original menu from 1940 hanging on the wall that includes t-ravs. No matter who made them first, Lombardo’s toasted raviolis are something to remember because they’re crescent-shaped, instead of square. Lombardo’s first opened its doors in 1934 in north county. It moved to its current location near the airport in the early 1990s. “It’s the special place for special occasions or to make any occasion extra special,” Tony’s states on its website. The restaurant is run by famous St. Louis restaurant family the Bommaritos. Before Tony’s, they opened the city’s first Italian bakery. Anthony Bommarito opened Tony’s in 1946 on North Broadway in downtown St. Louis. It was forced to move for construction of the convention center and dome, but Tony’s has been committed to staying downtown. Tony’s was—and always has been—a family affair for the Bommaritos. Anthony Bommarito started the restaurant in 1946, but died three years later. His son, Vincent—who had just graduated high school—took the reins. Vince has been leading the restaurant ever since. Boasting a superb wine selection and a dedication to the downtown community, Tony’s is continuing the tradition with several generations of Bommaritos in the restaurant. Spencer’s Grill boasts itself as “The Oldest Restaurant in Kirkwood.” It has been slinging pancakes, omelets and other diner favorites since 1947. When the Goody Goody Diner first opened its doors in 1948, carhops still brought food straight to drivers parked outside the north St. Louis restaurant. The times have changed and the business has grown, but the diner still evokes that classic feel. The large ‘Goody Goody’ sign still greets hungry customers—although the original flashing neon sign installed 61 years ago was swapped out in 2018 for a more modern version. Richard Connelly started working at the Goody Goody when his parents bought the diner in 1954. It was the only place he ever worked. Connelly and his wife continued the family tradition until selling the restaurant in 2014. The diner serves up breakfast dishes and classic diner favorites on Natural Bridge Avenue in the Wells-Goodfellow neighborhood. The area is rich in food history. The original business on Goody Goody’s corner was the first A&W Root Beer stand in St. Louis. Ted Drewes’ first location in 1935 was just down the street. Also, Melrose Pizzeria was right next door, which brought pizza to St. Louis in 1946, according to the Goody Goody website. Pio and his brother-in-law first opened this restaurant in 1954. It was known as the Continental Café until Pio bought out Frank and took over the business. Pio’s serves up authentic Italian recipes. His mother, who was from Italy, taught him how to cook. Many of the restaurant’s recipes come from Pio’s family and his wife Mary. The restaurant boasts being the first to bring thin crust pizza, toasted ravioli and pizza burgers to the St. Charles area. At the corner of Lemay Ferry and Bayless stands this Lemay institution. The original building on this space opened hundreds of years ago as an inn for weary travelers—before the U.S. was even a nation. Cusanelli’s as we know it opened in 1954. Nowadays, it’s serving up traditional Italian cuisine, with a focus on pizza. This restaurant has been a family tradition in University City since 1956. Frank & Helen’s says entrees and Broaster chicken have been customer favorites, but it’s the pizza that really puts this restaurant over the top. It’s even received national attention. Thrillist named it one of the 33 best pizza shops in America in 2015. The iconic restaurant as we know it got its start at Lindbergh and Clayton back in 1956. 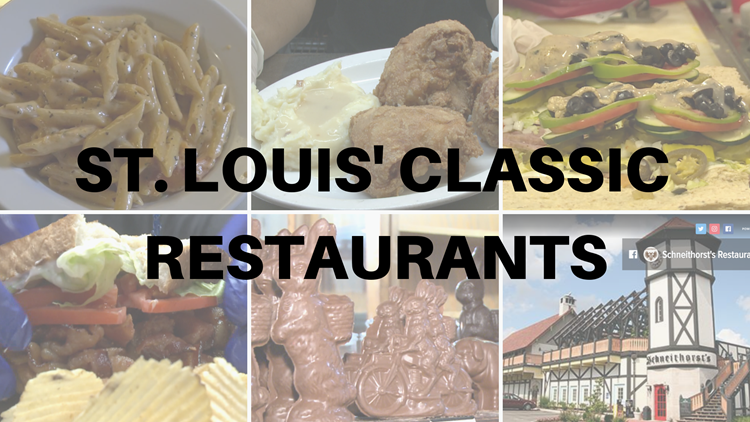 However, the restaurant’s website and social media pages says it’s been serving St. Louis for more than 100 years. Here’s why. Arthur Schneithorst Sr. first opened Benish’s Restaurant at 8th and Olive downtown back in 1917. The Depression years forced the family to close the doors, but their mark on the St. Louis restaurant world wasn’t over yet. The family went on to open another restaurant downtown: Rock Grill. In 1937, the Schneighhorsts took over the Bevo Mill, where Arthur Jr. was introduced to the Bavarian dining experience. That led him to 1956 and the can’t-miss, German-style building in Ladue. A fourth generation of the family now is carrying on the Bavarian tradition. Don’t be surprised if you drive up and see a classic car parked out front. 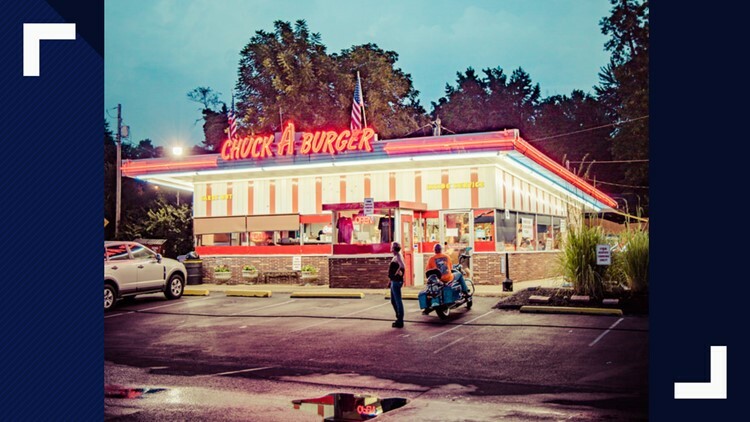 That’s because Chuck-A-Burger holds a unique distinction on this list. It’s the last remaining drive-in that offers an authentic full-time curb service—complete with car hops. The restaurant got its start in 1957 with eight locations. The last remaining location is still welcoming drive up and walk in customers with its neon lights in St. John. The restaurant serves up diner favorites. Online customers rave about Chuck-A-Burger’s curly fries and cheese cubes. The drive-in is family owned and operated, having been with the same family for three generations now.